The mythical island of the Phaecians, were Odysseus landed on his return from Troy. In antiquity Corfu was a Corinthian colony and trying to stay independent the island formed an allience with Athens. This was the main cause for the Peloponesian War as Corfu was not only used as a naval station by all its conquerors but it is also in the midst of a well used mercentile sea route. Throughout its history the island has been occupied by many, the Venetians having stayed the longest (from 1401 to 1797) however, it was the only part of Greece that was never under Ottoman rule. The island was well fortified by the Venetians and this can be seen in the capital, also called Corfu, which is the only city in Greece that is surrounded and enclosed by two castles. From Corfu town you can visit the islands of Pontikonisi and Vidos. Just outside the capital is Kanoni and south of the city of Corfu near Gastouri, is Mon Repo, an estate with archeological remains and the birthplace of Englands, Prince Philip and the Achilion, a summer palace built in 1890 by the Empress of Austria, Sissy, which is now a museum. Some of the highlights of Corfu were you will find castles, lush green scenery and intriguing beaches are, Dasia, Thinalio, Acharavi, Roda, Sidari, Kassiopi, Benitses, Messongi, Moraitika, Paleokastritsa, Krini, Ermones, Pelekas, Myrtiotissa, Pyrgi, Agios Gordios, Gouvia and Kondokali. Interesting information about Corfu can be found through the Greek Travel Pages (GTP), the municipality of Corfu and Wikipedia. Corfu, which is situated on the eastern side of the island. Lefkimi, which is situated on the southern side of the island. Approximately 50 meters from the port, on Avramiou street is the long distance bus terminal and a bit further down the same street is the local bus terminal. 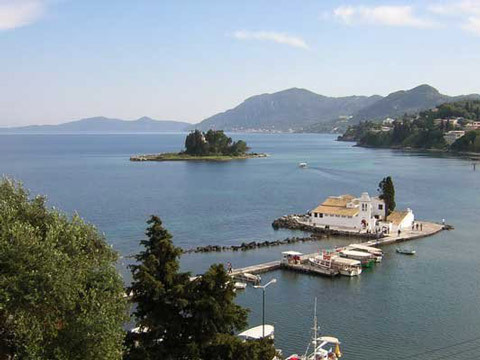 Ferry connections and schedules for domestic routes, like to Corfu, are usually announced by most shipping companies, a couple of weeks before the beginning of each season. Information concerning ports serving routes to Corfu can be found further down.